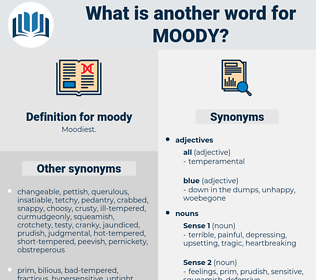 What is another word for moody? inflexible, settled, unalterable, invariable, immutable, changeless, unemotional, constant, unchanging, unchangeable, even, good-natured, stable, equable, steady. I was feeling a little moody in spite of it, and I decided to quit my job. After that, and suddenly, he fell into a moody silence which his host was not the last to note. 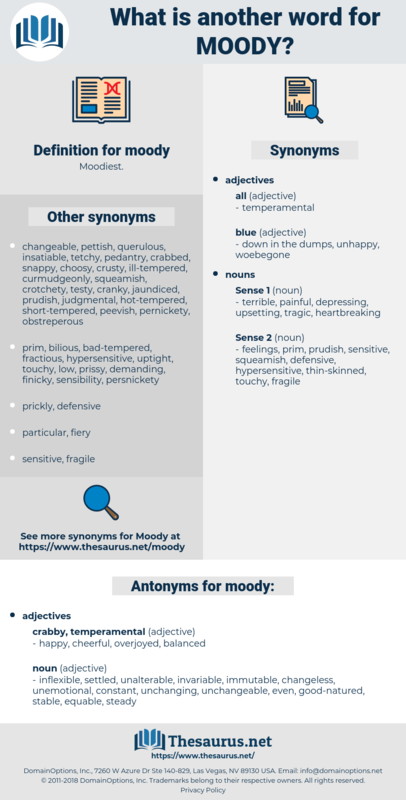 moiety, moot, maund, mamet, mammut, manatee, midi, mite, moth, mott, middy, manda, minute, minuit, monad, mimidae, mohammed, mote, maimed, maid, mt, maidhood, moment, mountie, matai, momotidae, made, Mothy, matt, mahound, matey, mantid, monnet, mantidae, mat, month, mandate, maundy, mete out, mediate, mennonite, md, montia, minuet, mot, Mahdi, mit, minded, matted, menotti, mead, manhood, monod, meed, mount, motet, manihot, manhunt, Mutawa, meditate, munda, midway, mind, mahout, mound, med, mode, monte, Mete, maenad, myth, mayweed, mediated, meat, mated, matte, method, muddy, madia, meade, minuend, MDI, monet, manumit, meth, momot, mint, mud, monday, miniate, manta, manteidae, mahomet, moneyed, monied, mande, manidae, mate, mutate, mod, matthew, muted, mentha, moodie, moat, myoid, mend, maidu, mounted, meaty, metadata, mut, mammoth, mitt, memento, mammutidae, minutia, monody, moated, mouth, manned, mutt, manteodea, medea, manat, muddied, monument, may day, mined, manet, mayday, meet, man-made, meted out, midday, motto, Mohammad, muhammad, mediety, mad, mid, math, minnewit, mood, mute, mantua, meadow.